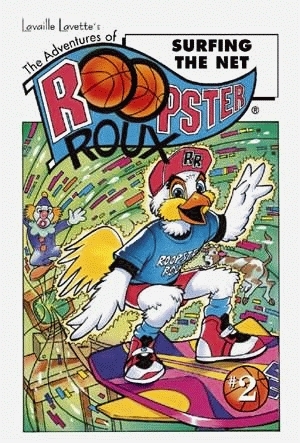 In the second book of this new series, Roopster Roux visits the library on his way to basketball practice before a big game. Once there, Roopster notices that the library is extremely quiet . . . too quiet, even for a library. As he investigates, he discovers that his teammates and Mr. Figby the librarian have all been trapped in cyberspace by the devious Tegore. Even worse, Roopster himself becomes trapped. Tegore cackles as he sends Roopster and his friends through cyberspace to the time of the dinosaurs. Roopster has stopped Tegore in the past, but can he defeat Tegore and the mighty Tyrannosaurus Rex? Using teamwork, Roopster and his pals devise a plan to defeat Tegore and escape. Who knows, they might even get in a little basketball practice in the process. NBA iron man A. C. Green of the Dallas Mavericks narrates this exciting adventure. Green knows the true value of teamwork, for it was only with the help of his teammates that he was able to break the record for most consecutive games by an NBA player.